Haha... I can tick most of those boxes. Where were you born and where did you grow up? Cool, where Chris Hoy used to ride if I remember correctly? Yep. The best way up onto the Pentlands is Bonaly and one of his Hoy range of kids bikes is named after it The first climb out of the houses was known as heart attack hill! I like that, not forgetting his roots! Where do you currently live? Well originally it was on BMXs in the 80s, going to friends houses and around parks and bits of waste ground in Edinburgh. We'd find wee jumps in the woods and things like that. Then mountain bikes came along and I got into riding the Pentlands with my brother. But I couldn't afford to replace the groupsets when they broke so abandoned it for skateboarding and basketball for a few years! Exactly. I took up the bike again at university in Glasgow, but only to get around. It was 2007/8 when I had stsrted my obsessive phase and took up road cycling. My wife at the time was French and in summer on holiday, I'd buy l'équipe, looking for summer transfer news. But in July it was wall to wall cycling. Finally in 2007 I started paying attention. It was the blaring headlines about doping scandals that caught my eye! Vino, Rasmussen, Millar coming back...after that I started riding with Stirling Bike Club and struggled away at 4th cat road.racing for a few years. In Stirling it's hard to pick as we are spoiled for choice. You've got the Dukes Pass, Take Ma Doon Road, Crow Road, Top of the World and Comrie Moor, all within easy reach. But I will say Stirling Castle as I rode that more than any other last year. 110 times in fact! That’s unique! Why 110 times? Do you work there? Ah, so pleasure then... I’ve never been up it, can you describe what it’s like as a climb? It always has a steep section whichever route you take. One of the routes was used in Stirling Bike Clubs Crit under the Castle. You go up King Street, which is cobbled, then up through Stirling's old town which is picturesque but steep. Then there are more cobbles as you approach the old kirk, and you are hugging the gutter for a bit of smooth road. The cobbles continue past the Portcullis restaurant and into the castle esplanade. It's pretty tough! But you are rewarded with fantastic views. Two of the other routes each have a nice steep hairpin on them - it's really worth exploring. The Tour of Britain had a time trial up there in the 90’s when it was know. As the Pru Tour. Boardman and Stuart O'Grady raced that. I think I have a post on my blog The Drum Up about it. 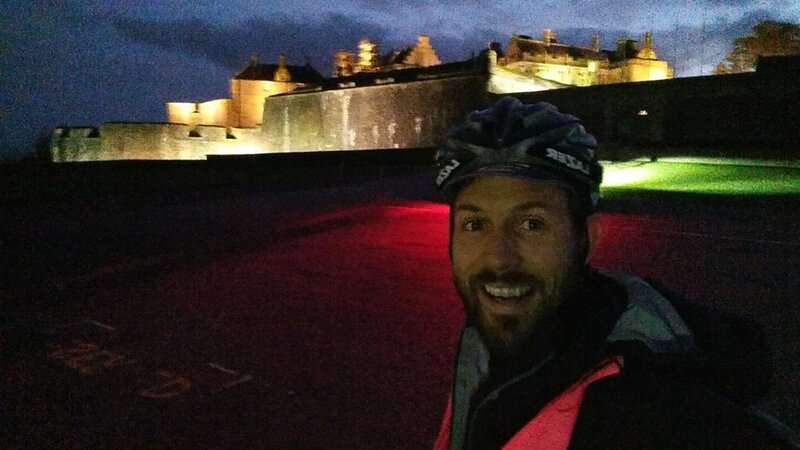 So is the climb up Stirling Castle suited to any kind of training efforts? It's quite a slog so you are going hard for 3 to 5 minutes so yes it's good to get intensity that you can't get on the flat. And it also is a strength workout especially if you are on a winter bike or wearing commuting gear. Didn’t realise it was that much of a climb to get up to the castle! Even descending it is a good test of skill as there are twists and turns and some sketchy off camber cobbles. Particularly nasty at night, in the wet! So the Strava segment is in your thoughts when you go up it? Last year the segments definitely were not in mind. I was just ridiculous & in the moment, feeling my effort on that particular day and experiencing the conditions whether they were hot or cold, dry or wet. In the past I had gone for KOMs and maybe had won them in 2013 or 2014 when I was racing, but some of the Stirling cat 1’s and 2’s always took them off me. Eddie Addis was always a bit of a cannibal regarding Strava segments! It's Dukes Pass or Crow Road probably. That's surprising Have you not been to the Pyrenees? I've been to the Pyrenees twice and both times it was near Bagneres de Luchon, The one I enjoyed the most from there was the Peyresourde. So you prefer the Dukes Pass /Crow Road to Port de Bales? The high mountains are great but I've never been able to visit often enough. We're lucky to have such good riding hear in central Scotland I think. It was 2010 and 2011 when I was in the Pyrenees, so quite a while ago! Cadel Evans, Contador, Schleck, all those riders have retired! It does make me feel a bit old! I know, seem so long ago since "Chaingate". What is the hardest climb you’ve summited by bike? There is a little known back road behind Luchon called L'hospice de France. It is not a long one, but felt like 10Km plus. I was dropped on the Deanston Road before Christmas after 60 miles round the Trossachs, taking in the Dukes Pass. It's an undulating back road that takes you in/out of Doune. I had been riding cross and short rides for the past two or three years and don't have the endurance and threshold I used to. I wear myself down when riding with mates over 2 or 3 hours and have nothing left in the legs! I need to build myself back up. Did you get back to them? Nice of them! Gruelling turbo session or climbing the worst climb you can imagine in wind and rain? Probably the climb! You'd get a better sense of achievement at.overcoming it!" Onto more current matters. Which team/club are you riding for this year, and what do you aim to achieve in 2019? Just flying solo! I'm just looking to up my mileage this year to rebuild fitness. I've put racing to one side for a while but I might do the Dukes Weekender gravel event for fun and to explore some new trails near Aberfoyle. Cool. What are your interests away from the bike? That sounds cool. Hope to do the same with my kids, their music just now is mainly Disney. Go to summer road bike? Kinesis Racelight - it's alloy, actually a winter trainer, but with lightweight wheels it just about does the job". One climb to ride said dream bike up? It would have to be something gravelly, so how about Col de la Sarenne, which is the rough n ready side of Alpe d'Huez. Favourite cycling movie? P.s I’m reading his Anquetil book, so good! I haven't seen loads of cycling films but Breaking Away is pretty classic. Favourite pro rider? Wout van Aert! Why? He's coming from cross to the road which is interesting and showed great potential last spring in races like Strade Bianche. Will be fun to see how he develops. He did a good ride in the European championships in Glasgow. Favourite piece of cycle clothing you’ve owned? Boring choice - a Gore Oxygen winter softshell jacket that has done me proud for nearly 10 years. Fun choice - a pair of genuine 1990s Festina glasses given to me by a French jeweller.